Food doesn't have to be super stressful and intricate. Three of my go-to dishes are steak, polenta, and broccoli in some form. They all taste amazing in their own right, all cook quickly, and bonus is they all go together. The other night I threw this dish together for a last minute date-night in. The whole meal took about 30 minutes to execute (not counting the steak coming to room temperature on the counter). This meal is easy enough to pull off on a week night, but special enough to serve to guests. If you're getting sick of the seasonal soups and stews, this will hit the spot right on. And the heavenly cheesey polenta will warm your bones on even the coldest of nights. Enjoy it! Brush both sides of the steaks with a little olive oil. This will help them not stick to the grill. Season both sides generously with salt and pepper to your taste. Set aside and go preheat your grill. Bring the chicken broth to a boil in a saucepan. Once boiling, reduce the heat down to low, then VERY SLOWLY AND WHILE WHISKING ADD THE POLENTA. If you add the polenta all at once it will bubble up and destroy you. Whisk the polenta until it's nice and incorporated. Keep the heat on low, whisk in the cream/half n half, then cover the saucepan with the lid, and let it cook, stirring occasionally. Generally the broth has enough salt in it to flavor the polenta, but if you're broth is a bit bland you may want to add a small pinch of salt. Bring another pot of water to a boil for the broccoli rabe. While the polenta cooks, go do the steaks. Grill the steaks on both sides to your desired doneness. I prefer medium rare. By the time the steaks are done, the polenta should be fully cooked through and beautiful. Make sure while the steaks are grilling you go stir the polenta too a couple of times. Add salt to the boiling water and throw the broccoli rabe in. Cook for 2-3 minutes, or until they turn bright green. Remove quickly and set aside. Rest the steaks on a platter. While they rest, finish the polenta. Take the polenta off the heat. Whisk in the two cheeses until they melt right in and thicken the polenta nicely. Set aside. 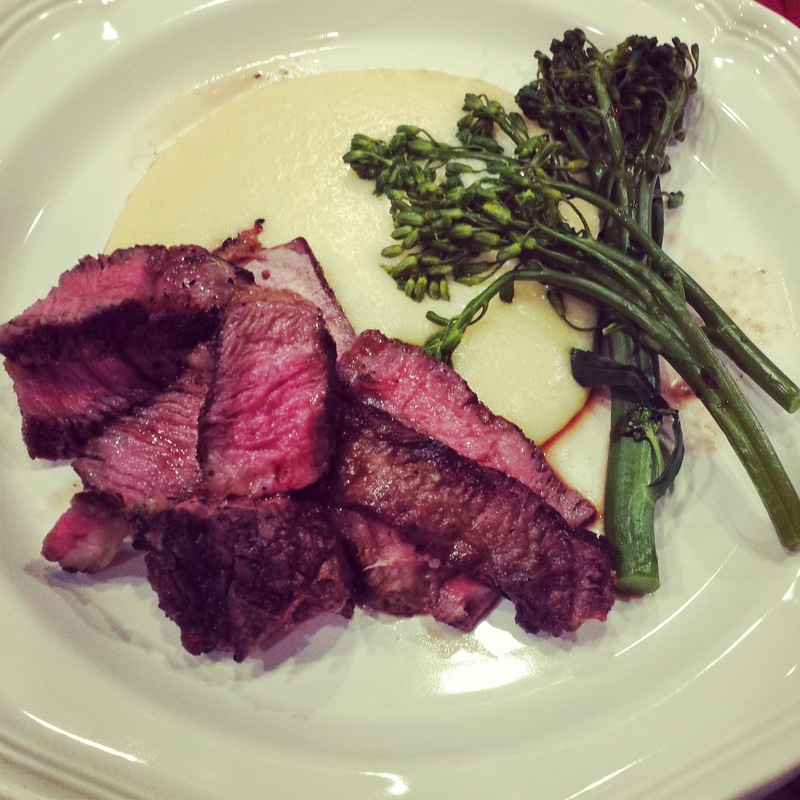 To plate, I like to serve the polenta on the bottom of the plate in generous portion, layer a few broccoli rabe on the side, and I like my rib eye sliced thickly on top. But you can just add the entire steak too right on if you like. Serve and enjoy. Wine: I like a good Malbec with this personally, but any wine will do.